So here we are in the heart of winter – with the dirty snow to prove it. These are the days when I look out the window thankful we are one day closer to spring – appreciating every extra minute of daylight. These are also the days when I am thinking about what I’m going to be growing in my spring/summer garden. What better way to spend some time than enjoying a mug of something warm with a stack of seed catalogs teasing you with the beautiful colors of summer? If you are a “gardener”, you know that this is the best time to really start planning your garden. What do you want to grow? How many plants of each item do you want to grow? What varieties can’t be grown together? 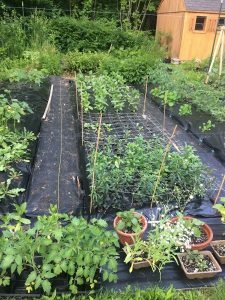 What garden space needs to be rotated from last year’s crop? When should specific seed varieties be started for the strongest, healthiest plants? There are so many things to consider! Now if you are a beginner gardener, don’t be discouraged. The truth is that even without a lot of planning, gardening is incredibly rewarding. The magic of planting a seed and watching it grow into something that you can enjoy is amazing. There was a time long ago when I lived in a townhouse with no land of my own. I had 3 balconies FILLED (probably exceeding the recommended weight limit!) with potted plants. I grew several varieties of tomatoes, cukes, strawberries, carrots, greenbeans, peas, lettuce and endless bouquets worth of annuals – including sunflowers! And that was long before I really considered myself a real gardener! The basics are pretty simple. You grow things that will work in the conditions that you have. 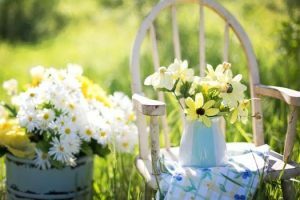 If something calls for full sun and you know that you really don’t have anywhere with full sun, you are going to place it where you have the most sun and hope for the best – realizing that the plant may not give you the results that you are looking for. If you look at a seed packet that tells you to start the seed 12 weeks prior to setting outside and it’s May 30th, you realize that you should have started planning sooner! – Now does that mean I’ve never started something really late and only been able to enjoy it for a short period of time? Absolutely not! Of course I have! These are the things we want to learn from though! You want to be able to enjoy as many blooms and veggies as possible during our short growing season. Gardening for people who don’t have much space but want to grow as much as possible. Also, the ever popular Companion Planting to really help your plants thrive just based on what they are planted next to… SO MANY good books and so much good information! Obviously the internet is another great resource for information. Dig in! As for seeds, there is no limit to resources for seeds. I tend to try many different varieties so I like to find places that sell smaller quantities for reasonable prices. Le Jardin du Gourmet (Artistic Gardens) is one of my favorite “small packet” places to buy from. A small packet is .40 and a large packet is $1.05 and they offer flower, vegetable and herb seeds as well as many other items. I also buy from Pinetree Garden Seeds (www.superseeds.com) every year because they offer many varieties I am interested in, but at a better price than other companies. I also consider Johnny’s Selected Seeds catalog required reading. In my opinion it is the best resource for finding things that will grow and grow well in our zone. They grow acres of trial gardens every year (in Maine) and only offer seed that they find to be successful. They also provide great tips and detailed information on planting and harvesting. I’m pretty sure that this wasn’t the subject Nick was looking for when he suggested a blog on planning Spring projects but a lot of homeowners (like me) are passionate about gardening so this was the project I thought I would start with. 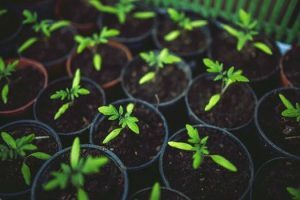 After all you can build a firepit, or design a patio anytime you want, but you have to start a well planned garden a few months ahead of time for real success. You have to select what you want to grow. Order your seeds. Wait for them to arrive. Plant them at their appropriate time and depth. Place them in a warm sunny window and wait for them to sprout. Get them tucked closely under fluorescent lights (I use one basic and one blue per shop light). Give them a gentle breeze to make them strong. Wait for true leaves to form before fertilizing…Baby your spring sprouts and wait for the day you can start to harden them for their final destination outside! Remember some important tips from your friendly Certified New Hampshire Home Inspector, Nick when planning your gardens. Keep vegetation at least a foot away from the foundation of your house and have your garden beds slope away from your house. You want to be able to enjoy your gardens without creating problems for your home.